So when I was asked to join in the Lollies 2017 blog tour, sharing the shortlist for the funniest books in children's literature, I jumped at the chance. And when I was asked which book I wanted to share I knew exactly which book I would give our award to. You'll have seen it several times on the blog already! It was our "Most Anticipated Book of the Year" last year and it made our top five "Best Reads of 2016". 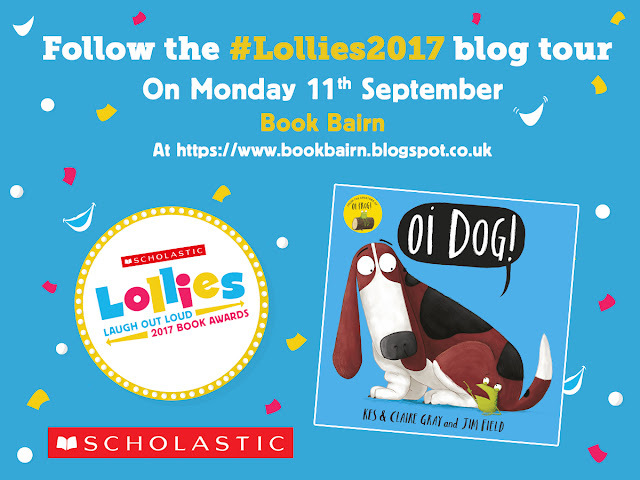 Oi Dog by Kes and Claire Grey and with illustrations by Jim Field is the second in the series and it truly is laugh out loud. In the first book, Cat sets the world to rights ensuring that everyone is sitting in the right spot - cats on mats, frogs on logs and so on. Frog gets a pretty raw deal when asks "what do dogs sit on?" I'm sure you can imagine - and if you can't you need to get a copy of Oi Frog too! And in Oi Dog, with the help of Kes and Claire Grey, Frog has decided it's time to re-write the rules! Unfortunately, some animals don't fare too well this time around, and in particular Cat feels the wrath of being such a bossy boots first time around. Jim Field's illustrations are packed full of humour and his characters of Frog, Dog and Cat are so wonderfully expressive and endearing it's pretty hard to resist them! As if that's not awesome enough, last week saw the release of Oi Cat! The final (I believe) installment in the series and we have enjoyed it so much that all three are back up on the 'Favourites Shelf'. Whilst I love Oi Frog and enjoyed Oi Cat my favourite rhymes are in Oi Dog (and I love the Cat getting its comeuppance). The rhymes are just ingenious, and the illustrations really are laugh out loud. It's a real delight to find a book that we can all enjoy re-reading night after night, time and time again. 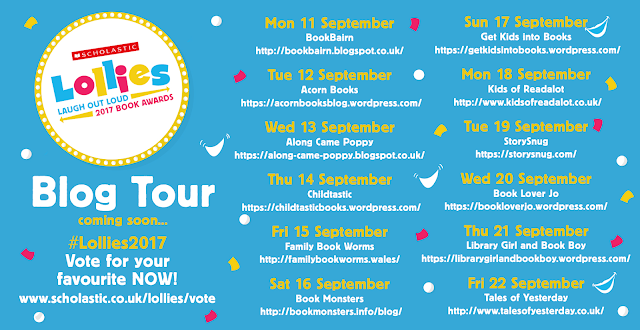 One of the exciting things about taking part in the Lollies 2017 blog tour is that we, both BookBairn and I, got to send our questions to the illustrator, Jim Field and we were delighted to learn a bit more about these fab books, and one of our favourite illustrators too! Which of the rhymes do you like best? Which one did you enjoy illustrating the most? My favourite rhyme of all the Oi books is 'Cheetahs sit on Fajitas’, although drawing a pile of fajitas was a bit repetitive and made me hungry. I think the Dragon sitting on the Wagon is probably my favourite character from the Oi series, he was great fun to design and I love his ginger hair. The dog from ‘Oi Dog’ is obviously based on a beagle, why did you choose this breed? Did you try different dogs? Beagle is close but it’s actually a Bassett hound. * I love this breed, as a young boy I was a big fan of 'The Dukes of Hazard' and 'Smokey and the Bandit’ anything with vintage American cars flying through the air! Sheriff Roscoe P. Coltrane had a Bassett Hound called Flash from The Dukes of Hazard and Smokey has a Bassett hound called Fred from Smokey and the Bandit. I love their friendly, dopey expressions and the faces are so full of character. Did you know I also drew a Bassett Hound for the two main boy characters in ’There’s a Lion in My Cornflakes’ by Michelle Robinson? One day I’ll get one. ** Until then I’ll keep drawing them. I did try a slightly bigger dog at the end of Oi Frog! not really a specific breed, but it was a bit of a squeeze, the long, low body of a Bassett just fits perfectly across the pages. *Looking back it is obviously a Bassett Hound - but I used our toy Beagle to recreate the front cover so I had that on my brain! ** And one day I'll get a beagle. When I met Kes Grey at the Edinburgh Book Festival last year he signed a book for BookBairn with the caption “Lottie, sit on a potty!” What would you sit on? I did an event with Kes for Oi Frog! a couple of years ago and he got me to sit on a hymn book. So Jim’s sit on Hymns. Kes meanwhile was sat on a fez. Being called Kim I guess I'd be sitting on hymns too! This could be a very longlist. But the names that spring to mind first are Charley Harper - I utterly adore his work, Gustave Doré, David Roberts, Quentin Blake, Marc Boutavant, David McKee, Tony Ross, Mary Blair, Eyvind Earle, Alexis Deacon, Abner Graboff, Julia Sarda. Oh it would be impossible to do it justice as Quentin Blake’s illustrations just sits so perfectly with Roald Dahl’s words but if I could re-illustrate any book it would be a Roald Dahl book, very hard to choose a favourite - either 'The Twits', 'Fantastic Mr Fox', or 'James and the Giant Peach'. Funnily enough orange is my favourite colour too! It’s warm, bright and happy. Penguins are my favourite animal, I love their funny walk and they’re like torpedoes in the water! Dinosaurs are always fun to draw. Today I’m drawing an Alligator, he’s a friendly alligator. And nearly as old as a dinosaur. Thanks for joining us Jim, and in particular for answering BookBairn's questions. She's also a huge fan of penguins so we hope you will have a penguin book out soon to make us giggle with their silly waddles and torpedo speed through the water! We have never read Oi Dog (or Oi cat & Oi Frog). I'm going to add them to the Christmas list. I know, I know, it's only September but December will be here before we know it, especially with babies. Is it just me or does time seem to go quicker with little ones around? They grow so fast! You have to get Oi Frog! It's brilliant and the other two don't make as much fun unless you've read it first! Absolutely! I started C-shopping this week! Thanks - she gets her love of orange from you and Louis! Oh no!!!! Someone has mentioned the "Chr......" word. Aaggghhh!!! I'm Colin so I should sit on a tarpaulin. The Oi books are great and BookBairn just loves them. PS - there's a cat comes into my garden that I would love to get it's comeuppance.